Today has been one of those days that just keeps on giving! I can't remember the last time I have felt so motivated and focused, if ever. This morning I woke up and weighed in. This is not my official weigh in, that was later on this morning before a PT session with Oli at Peak Fitness, but it gives me an indication of what I have lost. 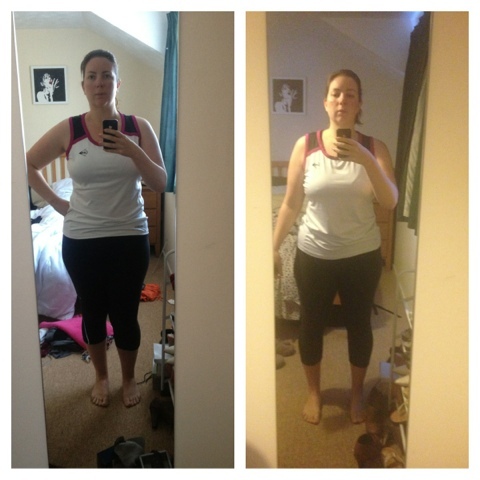 So, according to my scales, since my weigh in the day before London Marathon, I have lost 30lbs! I was curious to see what this has done to my BMI. So after a quick search on the internet I had worked it out to be 29.8, which meant I was no longer in the obese category! Aces! I'm not usually a fan of the BMI scale, but I found that this time, it really proved to me that what I am achieving is pretty amazing, I'm getting results, one step at a time. Generally I have had a mixed few weeks, after the Impetigo incident where I was on house arrest for a week and generally feeling sorry for myself at my temporary deformed appearance, I had my bad run during a race (see last post) and then a week away where I found it very difficult to stay focused on eating clean (all with a horrible routine that Oli had set me 3 times a week!!). One thing I have found easy is picking myself back up and getting back on it again, which leads me to the conclusion that routine is really important to me; it enables me to stay focused. Coming up to the beginning of December I was as usual offered an advent calendar by my Dad, and sensibly declined. This simple yearly tradition always end in exactly the same way, tearing the whole thing open on the 1st December and filling a bowl with all 24 chocolates, then polishing them off in about 15 minutes before hiding the wrapping at the bottom of the bin! Not this year though!! I follow a guy on twitter @StuartAmoryPT and had noticed that he was setting an Advent Challenge so thought I would give it a go, so not only was I getting smugatronic from no chocolate but I was motivating myself towards Christmas which I know is going to be a huge challenge for me. The Advent challenge started with a 5k run on Saturday, which I did, not a fantastic time, but negative splits and consistency, something that I haven't had for some time! Sunday was a dietary challenge, no sweets, chocolate or cake which I found quite easy, so stuck a strength session in for good measure. Today's challenge is to complete the hashtag #bytheendof2012, after a lot of thinking a decided on the sub30 5k that is bugging me, 5 man press ups and 6lb weight loss. So today I have made myself accountable, and have 4 weeks, eeek! I'm looking forward to the next 21 days’ worth of challenges! As I mentioned earlier today was PT day, we started with the usual weigh in, Oli's scales weigh slightly heavier than mine which meant according to these measurements my BMI is still over 30, but not by much, and as I said earlier, I don't usually take this measurement into account anyway. My own personal target this month was to get below 40% body fat, and I did just that with a reading of 38.7%, so I was well happy. My muscle mass has gone down slightly but as Oli said I have had good results despite the ups and downs that I have had this month, so it's all positive. We also chatted about my diet over the next month, basically more of the same, and we have agreed on two cheat days, this Friday coming as I have friends round in the evening, and Christmas Day. I was a little apprehensive of what exercises Oli had in store for me today, seeing as though I had hated last month’s so much and threw my toys out my pram during every single set in every session! As I was warming up he got a few bits and pieces ready as he explained that he would be switching things up for the next month. This programme is to be completed 3 times a week, and Oli has also asked me to include active rest a couple of days a week, and I can continue to run with Regency Runners once a week, but no more than 3 miles. We also had a little chat about my obsession with getting this sub30 for a 5k, Oli reminded me that this was not what I was training for, and to do so could risk me losing muscle so for the time being, this can go on the back burner. We talked about my own personal target of getting down to 25% body fat, and he is confident that I will get there in good time for the summer. I skipped out of there really looking forward to the month ahead, and ready to tackle Christmas head on!